and see your favourite photos. A unique and wonderful escape in one of New Zealand’s hidden treasures. We so enjoyed our wonderful few days ‘away from it all’ in this lovely hidden part of the world. Although we actually live in Akaroa the track had some wonderful surprises in store. 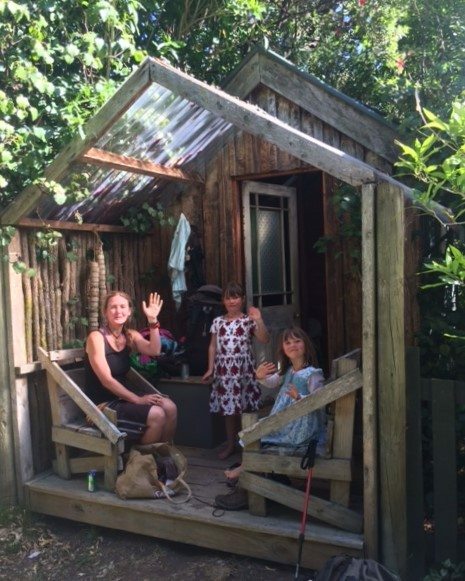 We took our time to absorb the amazing scenery, watch the wildlife in the bays, skinny dip under the waterfalls, enjoy the creative handy work and conservation efforts by the landowners and just be…. It made walking from one hut to the other a rather leisurely stroll. We were lucky with the weather though! The hut stays where all different but all most comfortable. We can highly recommend this to anyone who wants to spend some real good quality time with their partner, family or friends. No mobile coverage for most of the track surely helps! A lesser known gem. This track is just fantastic. The accommodation on all three nights was great but the final night at Stony Bay is just so quirky and interesting that it gives the track a whole new dimension. The scenery is varied including stunning coastal cliffs and bays, farmland, forests and steeper hills (which are almost big enough to be considered mountains). The bellbird song accompanied us most of the way and the penguins are an added bonus. We were also fortunate to see a few young sea lions on the rocks in Stony Bay. I highly recommend doing it in three days. The coastal scenery on the second day is just outstanding and it would be a pity to rush it. A wonderful few days. Loved it, amazing experience, 10/10 . For a first time doing a multi day tramp this was a great introduction . The places to stay (particularly the last one) were fantastic too. The walk was really varied, with lots of different areas of scenery ….. It was pretty up hill but felt like the actual timing of the walks took less time than expected. We met lovely people too ….. Even one day of rain didn’t stop the enjoyment of this tramp. Though there were lots of very muddy areas so recommend good boots. Highly recommended, overall a really enjoyable experience. Fantastic experience, service and landscape. Exceeded expectations, track well marked, excellent variety of terrain, native bush, farmland, seals, penguins, huts just the right balance of comfort and privacy. The store at Stony bar a real treat as was the bush bath after a full day of walking. We did the 2 day walk and was manageable with plenty of rest time and stops at points of interest. This was a stunning tramp with the most amazing views and a variety of different scenery from beautiful coastal scenes to gorgeous valleys of native bush with waterfalls.There was plenty of wildlife too, such as little Blue Penguins (we were lucky), baby seals (lucky again) and sea birds. Some of the clifftop walking was a bit tricky you have to take your time and watch your feet. I was very glad I had my pack carried on the first and last days. This allowed energy and time to visit all the side tracks which are all worthwhile doing if you can. Doing the track in two days would be a real shame as you would not have time to really appreciate everything it has to offer. Accommodation was quirky and comfortable. The whole experience exceeded my expectations by far. I will definitely do it again. Best hike in New Zealand! Awesome experience 🙂 After 4.5 months of travelling and much hiking in New Zealand I did the Banks Track at the last two days of my journey. It was definitely a great ending – it was the best hike for me during my whole trip! We had the most wonderful time! It’s a varied and beautiful landscape and the informative booklet we were given enhanced our experience of it. It’s a more supported and relaxed experience than the DOC great walks – less of a ‘pioneer’ sense of pride at the conclusion as a result. We loved the tiny shop! And feasted on the good food they sold. This walk is something special. Thank you Banks Track and Hinewai Reserve management for providing access to this wonderful part of your beautiful country. 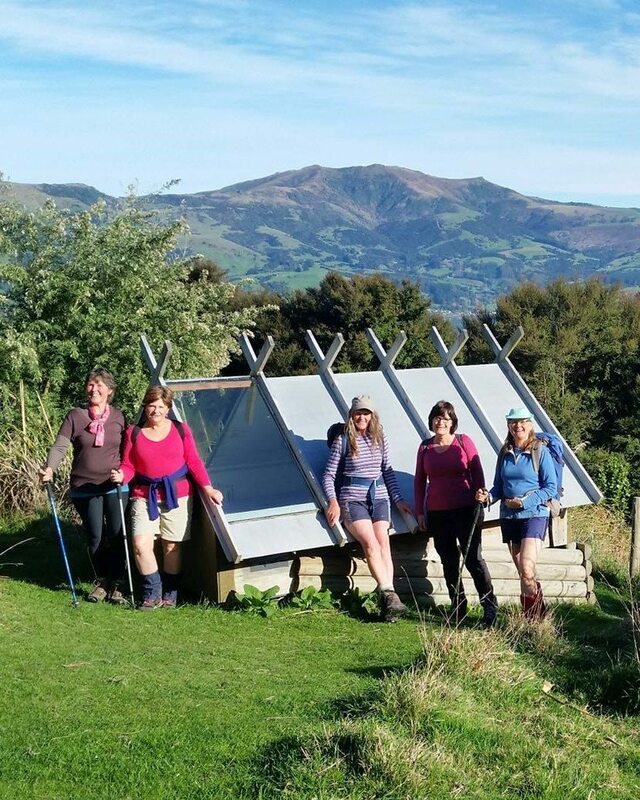 Love the sod roof on this shelter … and all the other quirky architecture along the track. How amazing – exhilirating -joyous – hard – fun -full of laughter. Thanks to the many amazing people who share this resource with us. Ka Kite Ano.